When the Carrier Engineering Corporation introduced the home air conditioner in the beginning of the 20th century, Willis Carrier enlisted Margaret Ingels as engineer, educator, and spokesperson. In 1916, Margaret Ingels became the first woman from the University of Kentucky and second woman in the United States to graduate with an engineering degree. Shortly after graduation, she began working as a traffic engineer but within a year, she began working for the Carrier-Lyle Corporation. Her experience sparked an interest in air conditioning and she wanted to advance her knowledge in the subject. Ingles left the Carrier-Lyle Corporation to obtain her professional degree in Mechanical Engineering; another first for women in the United States. 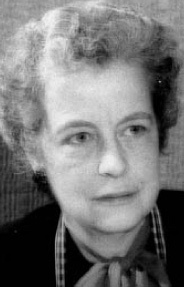 Afterwards, she worked in the American Society of Heating and Ventilation Engineers’ research lab and continued learning about conditioned air and ventilation. Throughout her career, she traveled the country showcasing the benefits of residential air conditioning while remaining active in research. 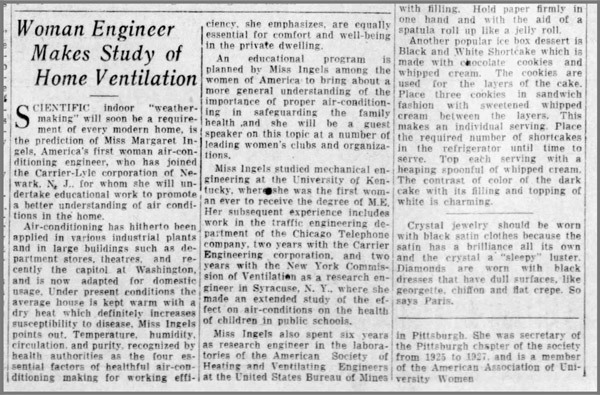 Ingles published roughly 50 papers and spoke to thousands about air conditioning and engineering. Additionally, she perfected the sling micrometer and developed the equation for “effective temperature,” which measures human comfort in relation to humidity and airflow. She retired from the Carrier-Lyle Corporation in 1952 but not before finishing the biography, Willis Haviland Carrier, Father of Air Conditioning. Today, United Technologies honors her memory through the Margaret Ingels Engineering Development Program that provides the top engineering students a chance to be fully immersed in the field of product manufacturing.